Steel Mains offers an extensive range of Steel Fittings to accommodate your total pipeline design requirements. Please download the below fittings brochures which outlines the various type of fittings that can be manufactured and detailed information on these fittings. If you require a fitting not shown please contact us to discuss your special requirement. Please find below a copy of our capabilities brochure which outlines an overview of the products and services Steel Mains provides. Please find below a copy of our product data handbook. In this brochure you will find information on the various coatings, lining, joints, sizes and fittings we offer. This brochure is an abbreviated version of our design manual. Steel Mains SINTALOCK® joint is a world leader in Steel jointing systems incorporating a Rubber Ring Joint with an external weld. 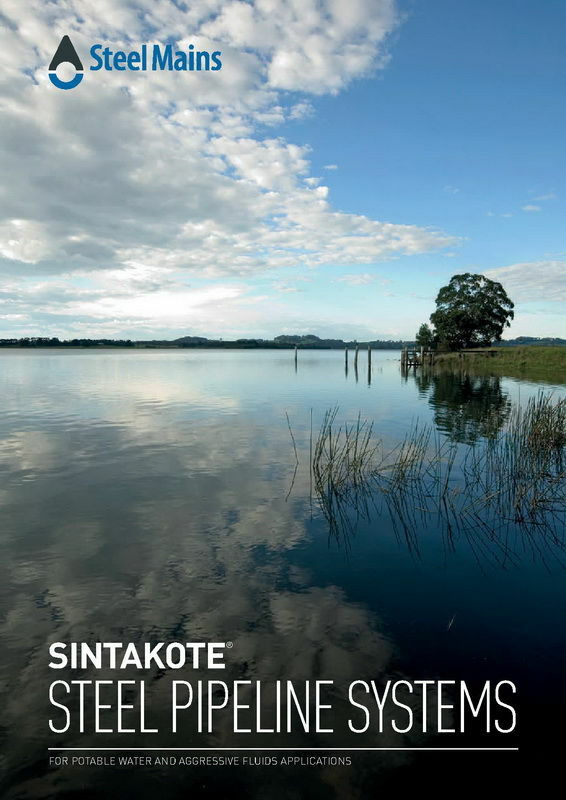 Please download the following brochure which outlines in detail the properties of our SINTALOCK® joint. Steel Mains Sintakote Pipeline systems are available in a variety of joints to suit variious applications. Please see below links to information on the various joints we can offer with our pipe and how to best utilise them for your next project. Please find below a copy of our synergy brochure which outlines an overview of the world class linings we provide on our Sintakote Steel pipelines.